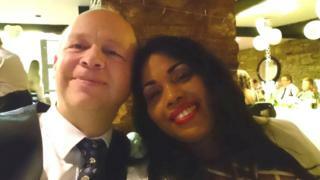 A woman who has lived in the UK for 17 years "may die" if she is deported, her husband has said. Pauline Taylor-French, 45, fled Jamaica with her two daughters after suffering violent abuse. Her husband, Grahame French, 56, from Shrewsbury, said she had lived legally in the UK ever since, but was recently refused leave to remain. The Home Office said all applications were considered on merit in accordance with immigration rules. Mrs Taylor-French had been in the UK on a series of student visas before she was detained at Yarl's Wood Immigration Removal Centre for 24 days in September 2017. Her husband said she lost more than a stone in weight, self-harmed and was on suicide watch while being held. Council planner Mr French said she was released on bail and the couple, who were engaged at the time, married 16 months ago. Since then, Mr French said the Home Office has refused her right to remain, saying there was no reason why the couple couldn't live together in Jamaica. He said the couple sent documents, including photos detailing "the abuse and violence my wife faced in Jamaica", to authorities. But Mrs Taylor-French now faces up to six months in prison and a 10 year re-entry ban, her husband said. "Why are they treating us like this? "All her family are here, they have settled status, she has British grandparents, she's married to me I'm a British citizen, we meet all the criteria for a spouse visa. "She almost died when she was detained, being sent to Jamaica could kill her." Mr French has launched a petition to Home Secretary Sajid Javid and said the couple's solicitor believes they have a strong case for a judicial review. In a statement, the Home Office said: "Where an application has been refused and a person has no legal basis to remain in the UK, they should make arrangements to leave."